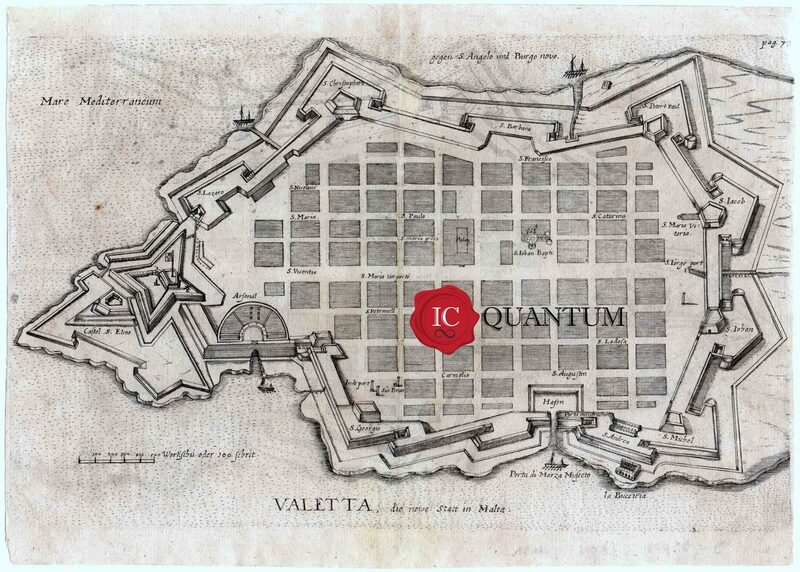 A very rare plan of Valletta entitled: VALETTA, die newe Statt in Malta. The author of the book Christliche / heden Insel / MALTA / Darinnen / Derfelben Landschafft, by Johann Friederich Breithaupt in 1632 and published in Frankfurth. The copper engraving measures 170 x 269 mm and the verso is blank. The plan is copied from Specklin’s “Architectura von Vestungen”, printed in Strasbourg in 1589. However in the Specklin map the names and titles are full of flourishes. This plan of Valletta has ‘pag. 72’ at the top-right corner showing the position where the map should be inserted in the book. This very rare travelogue describes the route taken by Breithaupt, the brothers von Streitberg, and the Marschalck von Ebeneth who travelled together in the 1624 trip to Malta. Along with the early geography of Malta, the report also deals extensively with Southern Italy and Sicily. Inter alia with plans or views of Messina, Palermo, Catania (but titled ‘Catana’ in the book), La Valetta, Naples, Puteoli, Mola, and the map of Malta.